Paddle Australia’s future in the Olympic discipline of canoe slalom is looking bright with Australia’s under-18 slalom talent impressing at the 2019 Canoe Slalom Junior and Masters National Championships at Eildon, Victoria over the weekend (19-20 January 2019). It was the youngest paddlers, who impressed selectors at the event, which is part of a selection series to identify the best canoe slalom talent for the National Development Squad (NDS) and future national teams. Under 16-paddler Sophie Wilson from New South Wales was one of the stand-out athletes at the national championships and is following in the footsteps of Australia’s Olympic slalom star Jessica Fox winning both the women’s canoe single (C1) as well as the women’s kayak (K1) events and taking home two Junior national champion titles. Wilson also was the fastest C1 paddler in the “best-of two” qualifying races on Saturday in a field that included under and over-18 paddlers. This secured her a piece of national team uniform as a special gift from dual Olympic medallist, seven-time World Champion and most successful canoe slalom paddler in the history of the sport, Jessica Fox, at Sunday’s medal presentation. “I’m really excited and when I get back to Penrith, I will say a big thank you to her. She’s a big person to look up to. We have amazing paddlers in Australia and Jess is just out there. But I also wouldn’t be here without the support and work of Ros Lawrence,” the Penrith Valley Canoeing paddler thanked her club mates, including C1 World Champion and current World number nine Rosalyn Lawrence (NSW) for the coaching support. “We are not that many girls but it’s good that we are all very close together. I just want to try my best and see how I go, do well and have fun too. I’m hoping to make the NDS and maybe the Junior Team as well,” Wilson added about her goals ahead. Under-18 paddlers from Melbourne Canoe Club Abby Collins and Claire Tonkin completed the K1-podium. The C-1 podium was taken by an all under-16 line-up with Sophie Wilson at the top and Melbourne Canoe Club’s Georgia O’Callaghan and Kate Moorhen in second and third. 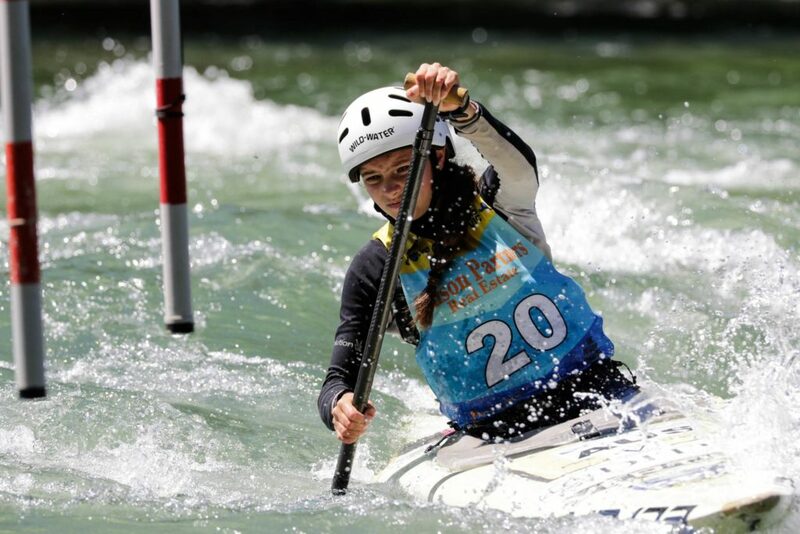 Fellow Melbourne Canoe Club and under-13 paddler Sarah Crossbee also impressed after finishing fourth in the C1, ninth in the K1 and as the fastest under-14 C1 paddler at the event. In the men’s events, Western Australian Jack Choate once again left a mark after already making last year’s Junior National Canoe Slalom team as the youngest athlete on the team. The under-16 paddler took out the national Junior title in the men’s canoe single (C1) and added a silver in the men’s kayak (K1). Choate had a consistently strong performance over the weekend, topping the “best of two” ranking after the two qualifying races on Saturday in both events and finishing as the fastest overall men’s C1 in a field of under and over-18 paddlers. With these results and following strong performances at the Senior Canoe Slalom Nationals last weekend, chances are high Choate will make the team again this year. “The final selection races are next up at the Australian Open in Penrith (15-17 February) and I’m trying to make the Junior team for Australia, so I can go and race in the world championships in Poland July next,” Choate said confidently. “I was pretty happy with all my runs on Saturday. Overall, three out of my four runs were pretty good and it felt really nice on the water. For me it’s just to get out there and do the best I can do on the day, so I tend not to think too much about the results, but it’s always nice to get a first,” Choate said after racing and about beating the older paddlers. Melbourne Canoe Club paddlers Daniel Shamieh and Ben Ross completed the men’s C1 Junior National Championships. The K1 podium was taken by an all 2018 Paddle Australia Junior National Team representatives line-up, with Joshua Montalto (VIC) taking home the National Champion title, Jack Choate (WA) in second and Bradley McLaughlan (VIC) in third. “The weekend went really well and I thought I raced well. 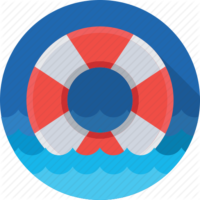 The course is a lot of fun and has a good water level and I thought it went well overall. Today, I maybe lost a bit of time at a couple of gates, but overall I was pretty online and clean, which is always good,” Josh Montalto said about his racing. Held on a series of rapids on the Goulburn river, over 120 athletes from around Australia contested the event. “This is the first year that we’ve been separated the senior nationals from the junior nationals and we’ve done a lot of work to set that up and I think that’s been a real success. We’ve had a really successful Seniors nationals at Brady’s lake in Tasmania on a fantastic course, really challenging experience for the Seniors and we’ve come here to Eildon and had a great Junior race. 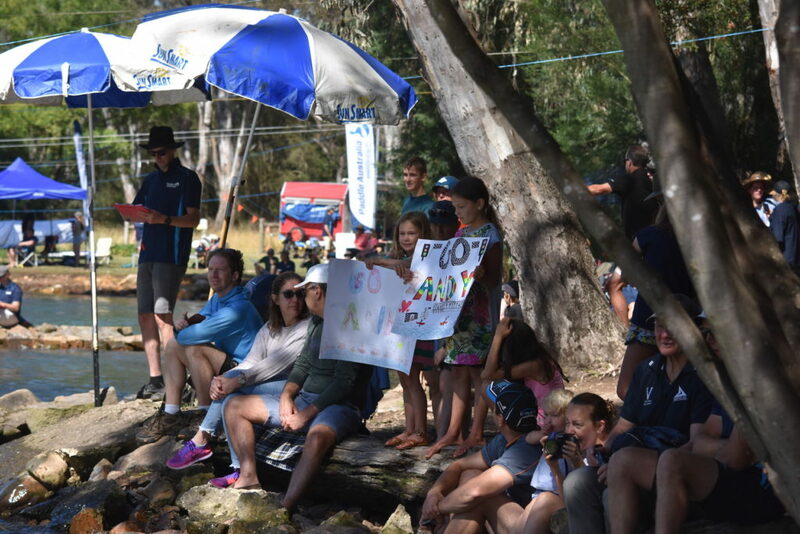 And the Juniors have really been the stars of the show and that is what we wanted,” Paddle Australia’s Lead Pathways Coach Canoe Slalom Mike Druce said about the event. The National Championships included two qualifying races on Saturday, before an A and B final on Sunday with Lead Pathways Canoe Slalom Coach Mike Druceimpressed by the quality of the competition. “It’s been fantastic. We’ve definitely seen an increase both in the numbers and in the quality of the juniors. The under 16 cohort is especially strong this year and really competitive and it’s great to see athletes developing at that point. I think it’s a bit of a start of an increase in numbers and also the quality of the paddling we are getting in the lower age groups, so I’m really excited to see that. 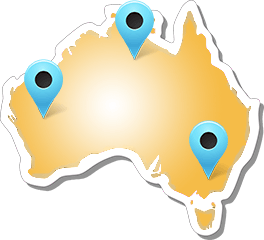 And also to see the work that everyone is doing in our pathway hubs and in the states and clubs is starting to show and hopefully we’ll build on that year on year,” Druce said about the work of the pathways program. And about the selection relevance of the event he added, “The racing here was part of the selection process for the new National Development Squad (NDS), which is a new initiative and something we have developed to raise the level of training for the Juniors. 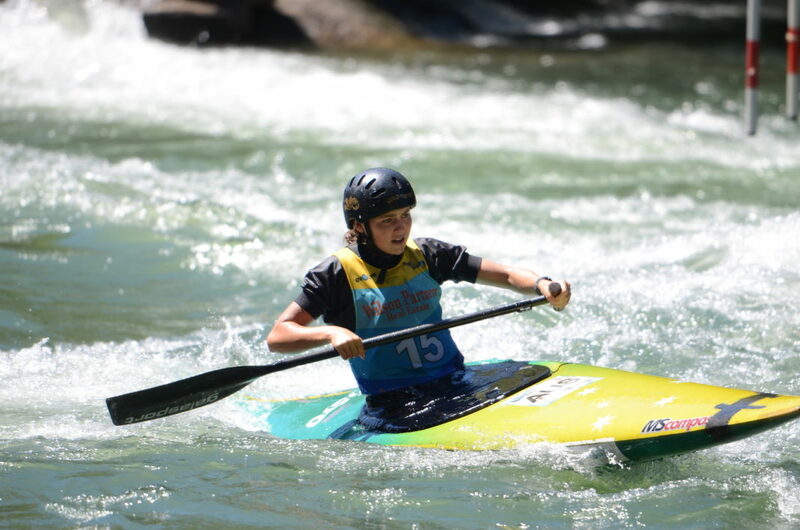 The 2019 Canoe Slalom Juniors and Masters National Championships complete the Paddle Australia National Championships series this month after the Wildwater National Championships at the start of January (4-6 January 2019) and the Canoe Slalom Senior National Championships taking place last weekend (10-13 January 2019) in Tasmania. The event featured last year’s Paddle Australia national junior team representatives as well as the country’s top under-18 paddlers who are aspiring to be part of Paddle Australia’s National Development Squad (NDS) and to represent Australia in the Olympic canoe slalom men’s and women’s kayak and canoe events at this year’s ICF Canoe Slalom Junior World Championships in Poland in July. The national championships also decided the national titles in the over 35-age groups with no age limit in the sport of whitewater paddling. The 2019 Canoe Slalom Junior and Masters National Championships were jointly organised by Paddle Victoria in partnership with Paddle Australia and were supported by the Victorian Government through the Significant Sporting Events Program. The championships were run in co-operation with Goulburn-Murray Water, Murrindindi Shire and the Outdoor Education Group. 350 paddlers from over 30 countries including the world’s best canoe slalom paddlers. Australia’s slalom star Jessica Fox and several Olympic and World champions from around the world will contest the two weekend event that includes the Australian Open (15-17 February 2019) as well as the Oceania Championships (22-24 February 2019).